OK, so it wasn’t a movie, but it had moving images in it, so that’s close enough in our book. The Basket of Goods and Services has become an unlikely star in the ONS stable, particularly this year’s edition. In the 70 years since its inception, the Basket has become an unintended barometer of social change and evolving tastes in the UK and the media can’t get enough of it. Which is why we leapt at the chance to produce a piece of content for Visual.ONS on the latest additions to and subtractions from the 2017 Basket, published on 14 March. Imagine our joy as a team when we discovered that a handful of 2017 additions to the Basket appeared to be straight out of the Hipster Handbook. We’re always looking for new and novel ways to bring ONS data to light, especially if it means we can experiment with a platform which is relatively new to us at Visual.ONS. The topic was also like manna from heaven for Lisa, a former tabloid news journalist, to be differently creative. Our mantra at Visual is to find the right platform for the story. How do we best package the information before us to communicate with the readers? We decided early on that this was a topic we could be ‘out-there’ and have a little fun with. Thankfully, the owner of the data, Phil Gooding from Consumer Price Inflation, was prepared to give us the opportunity. We’d previously worked together on a look at the Basket over the past 70 years, so I think he was prepared for us taking an unconventional approach. The new additions to and subtractions from the Basket – although serious in their ONS function – are things that everyday readers can easily identify with and help spread the ONS name out there on topics that are less easy to relate to – perfect for Visual.ONS. Our team has been experimenting with a storytelling platform called Shorthand and after meeting them in their UK headquarters, we came back full of ideas for the ‘Hipster Basket’. We very much saw this as a design-led piece, which would be simple to explore and allow the reader to interact by scrolling through the content at their own pace, putting them in control. 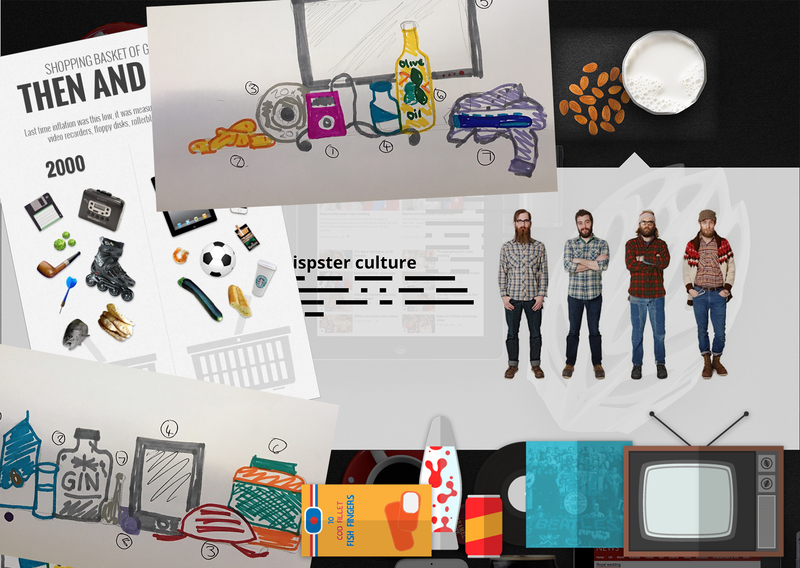 The concept, dreamed up by Visual designer Tom Davy, was to fill the page with the ‘hipster’ items, from the 2017 Basket and beforehand, but focus the spotlight on one item at a time. As readers scroll through the content, a new item is revealed, accompanied by some background information. This was a great project for designer Tom to be a part of as it enabled him to stretch his design muscles in a different direction from producing the bread-and-butter ONS content. We have a fantastic portfolio of digital products, but designers are visually-creative people, who want to push boundaries. Tom, who has a sizeable collection of checked shirts, channelled his inner hipster to come up with the best way of presenting the 2017 Basket. Don’t let his beard fool you; he doesn’t drink craft beer, own a record player or even ride a bicycle. A huge amount of development went into the story, experimenting with different visual styles and treatments before we found what we believed would be successful. Finding a balance of items to illustrate the theme was a challenge. We wanted to set the scene but not distract from the actual content. This is where the development of the fade and reveal came into play. By using this treatment we were able to highlight the content while also being able to set the scene for the story that was being played out. After all, you can’t really reference a hipster without a typewriter. We were confident that the finished version would be appealing and stand out from the majority of previous Visual.ONS content. Pushing boundaries. The Twitter love we received was heart-warming. Finding support for new editorial approaches in a conservative organisation such as ONS is sometimes challenging, so good press serves Visual’s case well, we think. Although impressions were average, engagement was quite high. For some reason there was a high response on our tweet about gin making a return to the Basket as well as the removal of basic mobile phones. The same was the case when we looked at Google analytics. Although the page views for this piece were respectable, they weren’t stratospheric. We have a number of pieces of content on Visual which we would describe as slow burners. We think this is one of those pieces; it will be around for a while. 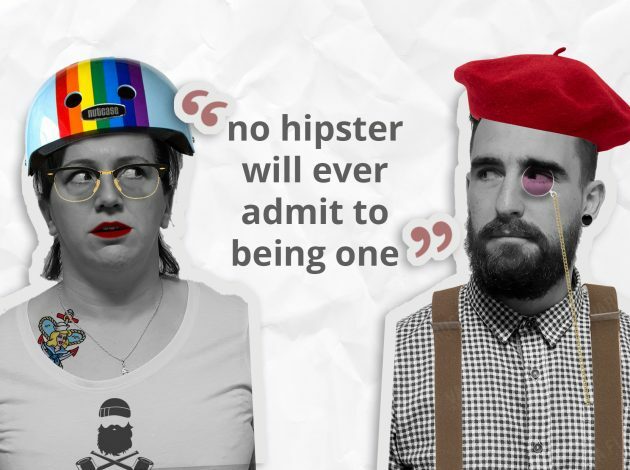 Two elements which made it to the final cut were essentially tongue-in-cheek definitions of hipsters. We knew that our readers would get it; they’re a sophisticated bunch. But, hey, guys, keep the love a-comin’. It keeps us warm on chilly days. Our own Deputy National Statistician, Jonathan Athow enjoyed reading the piece and sent us an email to tell us so. There’s also the core definition of a hipster, which we knew would save us from any criticism; no hipster will ever admit to being one. Game, set and match, gentlemen…and women. You can read Hipsters, gin and the Basket of Goods by clicking on Visual.ONS.gov.uk.